A visit to Provence – one of the most visited areas in France – is the second post in the Barefoot Blogger travel series by Nancy McGee of Absolutely Southern France. Nancy has lived in the south of France for over 30 years so, I’d say, she knows her way around. When asked “what do you recommend when tourist want to visit Provence?” Nancy gave me her picks below. Now that I’ve visited with Nancy in Sete and we’ve taken a some really fun trips together, I’ve learned to take her advice. In fact, I’m convinced it’s really important to ask an expert to help with your plans. If you have limited time, a bit of sage advice will help you make the most of every day you’re traveling. You’ll see the places you’ve heard about as well as off-the-beaten-path sights you’ve only dreamed about. It’s the best way to sample French life like you’re a local. Need I say more? From bustling, edgy Marseille to the red cliffs of Cassis, fragrant lavender fields of the Luberon, Aix-en-Provence’s colorful markets, wine and art … there’s something in Provence to please everyone. No wonder it’s everyone’s favorite. “Anyone who has seen Paris, but hasn’t seen Cassis, hasn’t seen anything,” said the Nobel poet Fredric Mistral. When visitors see the stunningly pretty Roman harbour it’s invariably love at first sight. Two natural monuments protect the town: Cap Canaille, that glows red when the Mistral blows, and the white limestone Calanques (sheltered inlets) that can be admired on a short boat outing. It’s a joy to simply roam the streets, browse the museum, or enjoy fresh seafood with a glass of the local rosé wine. A meal without wine is like a day without sunshine… and there’s plenty of each in Bandol, where vineyards bask in 3,000 hours of sunshine a year! The resort itself – just a stone’s throw from Marseille and Cassis – is among the oldest and most popular on the coast. Its sandy beaches lured the literary set long before the days of Brigitte Bardot and Saint Tropez. A cliff stroll, a vineyard tour and dining on fresh seafood – to which the fruity and racy rosé wines are a great accompaniment – is on everyone’s list. Red Wine…The distinguished red wines of Chateauneuf du Pape need no introduction. Masterclasses, food and wine pairing workshops and wine tours of the historic chateaux and vineyards are “must do’s and can be arranged. The vineyards in Chateauneuf du Pape are so cherished that a 1950s decree banned flying saucers from sailing over them! The tiny town itself is sheer magic. Take a walk up the hill to the ruins of the 14th century château – ‘the Pope’s castle’ – and the reward is a view as far as Avignon and its Popes’ Palace. Hungry after that climb? There are many fine restaurants in town serving traditional French cuisine to complement the wines. Sur le Pont d’Avignon…Standing on the legendary bridge in Avignon provides a good view of Le Palais des Papes,’ (Popes’ Palace), the ancient ramparts and much more of this historic and cultural French city. There’s something for everyone here: museums and galleries; fine dining to please the most exacting palate; and plenty of shopping. During the Avignon Festival in July, live music and theatre fill every street, but the ‘hot ticket’ is a performance in the Popes’ Palace. As for the bridge, the angels inspired a poor shepherd, Benezet, to build it and, convinced of divine intervention, the town’s authorities canonised the shepherd. That’s the legend at least and a popular song was born. From Ancient Rome to Van Gogh, Gaugin & Picasso … Located on the banks of the Rhone River and known as the ‘gateway to the Camargue,’ Arles is one of the most beautiful cities anywhere in France. The ancient arena, amphitheatre and Roman baths top any visitor’s list, as well as a walk in the footsteps of Van Gogh, Gaugin & Picasso. Talking of Van Gogh, a visit to nearby sunflower fields will brighten anyone’s day. Lavender Fields Forever ...The very best time to visit the Luberon is July, when the Valensole plateau is awash with lavender and the towns are alive with festivals celebrating everyone’s favourite flower! It’s a sight – and scent – to behold! There’s something here for foodies too – from a range of small bistrots serving the “dish of the day” to the local delicacy “lavender honey. Here’s Van Gogh Again! Whilst we’re in the area, let’s not miss St. Rémy. Pretty and picturesque, this pocket-size town offers much to do amid its narrow medieval alleyways, shady squares and wonderful architecture – including museums, excellent restaurants, an annual donkey fair and the remains of nearby 2nd century b.c. Glanum. 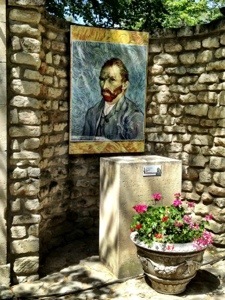 As for Van Gogh, his stay in St. Rémy inspired many masterpieces. “Ils Sont Beaux.” Set on a rocky plateau, magical Les Baux de Provence offers stunning views of Arles and the Camargue. It is a listed heritage site that has earned the accolade of ‘one of the most beautiful villages in France’, amongst others. What it lacks in size it makes up for with art and cultural activities, one of which is the annual Carrières de Lumières – the most amazing light show we’ve ever seen. The City of Art and Lights. Beauty, culture and a rich historical heritage exemplify Aix-en-Provence, hometown of Paul Cézanne among other luminaries. Having taken leave of lavender fields and vineyards, here is the opportunity for some serious shopping, sightseeing, not to mention food tours and culinary workshops. . Follow in the footsteps of Cézanne, browse the museums or the famous farmers’ and flower markets or buy that designer outfit in one of the upscale boutiques. There’s never enough time in Aix and you’ll never want to leave! How’s that for a tour of Provence? What are you waiting for? I can’t wait to see it all myself! Geoffrey’s Citroen now has a name: “Ales (pronounced Alice) the Cat”. Named for a village near here– Ales. And “Cat” –because her little diesel engine “purrs” like a cat. It’s proper that Ales the Cat has a name. We are dependent on each other for the next few days. Besides, I’m growing quite found of her. Geoffrey was so right to have a luggage rack on Ales’ roof. She’s easy to find in a parking lot. Especially when I keep forgetting she’s silver. Ales and I started out early this morning on Van Gogh’s trail heading for St. Remy de Provence It was a beautiful, sunny day with light wind and temperatures in the high 70’s. Our planned stops along the way to St. Remy were the towns of Remoulins and Beaucaire. 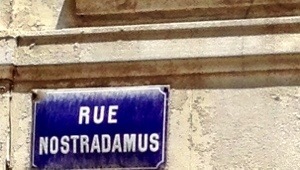 I’m not certain why I chose to stop in Remoulins. However, I did find a cemetery to visit while i was passing through. I’ve seen cemeteries along my trip that looked interesting, so stopping in Remoulins gave me a chance to check one out. To me, it’s interesting to see how different cultures honor their ancestors. In Remoulin and other areas of Provence, the deceased are buried above ground in family plots. Most grave stones date back many centuries. Each grave in Remoulin is adorned with elaborate porcelain flower displays and family memorabilia. Moving onto Beaucaire, the scenery definitely changed. The older part of town where tourist visit is centered around a busy canal. Marine traffic is active, mostly for pleasure boats, and cafes and restaurants cater to transients and locals. Often boats are moored in the marinas for winter for travelers touring the western Mediterranean. 1 If you’re wondering how I find my way around, it is relatively easy. I have a Michelin Atlas of France which I found in the apartment. I know the main ways in and out if Uzes. So with a couple of stops at petrol stations along the way to ask directions, I got along fine on this trip. Note: Both petrol stations had female attendants. Neither spoke English. I simple pointed where I was going on the map and they totally understood what I wanted. They gave me perfect directions. Not to be sexist, but a man giving directions would have described every landmark along the way. The females just drew straight lines from one turn to another. Simple. 2 Another guide for finding your way on the roadways is “round-abouts.”I’m not kidding, there are round-abouts every two miles or so along the highways. That means there are frequent directions on signs that point your way. 3 When you get into a city, there are clearly marked signs to follow. If you don’t see your destination on the sign, just keep going straight. Soon there will be a sign that says: Autres Directions. Follow that sign. It will lead you to the right road. St. Remy is advertised as the one place you must see if you want to experience Provence. Now that I’ve been there, I’m not too sure. I prefer Uzes. Nostradamus was born in S t. Remy and Doctor Albert Schweitzer was “hospitalized” here in 1917-18 when he wrote The Decay and the Restoration of Civilization and Civilization and Ethics, part of his philosophical study of civilization. Driving into St. Remy, an almost “spiritual” feeling came over me. There was something different about the countryside . It felt like a movie set. The road into the city is lined with white-banded “plane” trees, like those leading out if Uzes. But they go on for miles and miles. Ancient stuccoed farm houses and buildings are close to the road with lush farmlands spreading deep behind them. The historic district of St. Remy is set in a circle. Ales and I found a parking place in the public lot that was close to the entrance of town. After depositing almost $5 in the meter, I looked for the tourist office. Before I had gotten very far, the menu special at a charming cafe caught my eye– salmon. I stopped for Dejeuner. 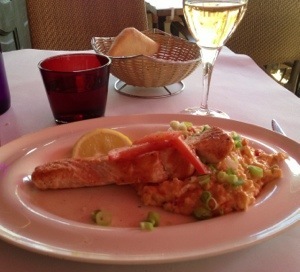 Perfectly prepared salmon, risotto with tiny chunks of tomato and scallions, and a glass of rose totally satisfied my hunger. read the publicity about St. Remy being “the place to be” in Provence. There is definitely a unique atmosphere in St. Remy. It reeks with the flavor of “the rich and famous” and the richness flows through the shops and boutiques — too expensive for my budget. Walking around St. Remy, there were so many times I reminded myself, “Van Gogh was here”, I could imagine how he was inspired. It inspired me. The creme de la creme of my day was a tour of the asylum at Saint Paul-de-Mausolean, the monastery complex where Van Gogh was voluntarily committed from 1889-90. From here he produced two of his most notable works, “Starry nights” and his self portrait. Taking the photos below, I was transported to Van Gogh’s day and time. I could imagine how he felt fortunate for all the beauty around him, in spite of his imprisonment. The entrance, the buildings, the inside, Van Gogh’s Garden, the chapel, the view! Van Gogh was released from the hospital at Saint Paul-de-Mausoleann in May 1890 and left for Auvers-sur-Oise, near Paris. He shot himself on 27 July 1890 and died two days later.